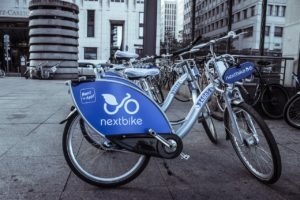 Bike-sharing schemes are a relatively recent and increasingly popular way for residents and visitors to negotiate cities. In just 20 years, bike-sharing schemes have taken off around the world and it is now estimated that more than 1,000 cities globally have them with more than 17 million bike-sharing bicycles now in circulation, illustrated perfectly by this animated timeline of the evolution of bike sharing. In a typical scenario, customers are able to rent bicycles on a weekly, daily or hourly basis. Bikes can be used by commuters to get from a central bus or train stations to their place of work or for moving from one meeting to another, or they can be used by local residents or visitors for negotiating a city or simply for leisure. Whilst bike sharing has improved significantly since the first successful commercial scheme in 1995, it is still not without its challenges. These include monetization of the scheme and how to best maximize the investment; acquiring and adding new users; managing a whole lot of new payment methods; and creating incentives for using the service. Not only does this require new partners to be added, but the management of new revenue flows and the ability to provide new services and promotions must also be considered. As well as losses through theft and damage, there are physical and logistical considerations to take into account to ensure that bikes are located throughout the network in such a way as to meet demand. A scheme that does not have enough bikes to meet demand in locations like central stations during peak commuter times is unlikely to succeed. To keep moving bikes from one location to another in order to keep up with demand can be an expensive and time-consuming process if not correctly managed. The advent of bike-sharing schemes is a consequence of the global trend in digital transformation. IoT technology makes it easy for consumers to hire a bike via their smartphone and enables providers to direct users to find available bikes. As well as providing a platform for hiring, dedicated apps can be used to take mobile payments, provide data insights and navigation tools and act as a marketing medium, all of which create a more convenient and enhanced bike-sharing experience. However, this new connected world calls for extreme monetization agility. The transition to complex IoT ecosystems means companies are now finding themselves having to adjust to a more sophisticated ecosystem involving multiple partners. Bike-sharing schemes can be provided by a bike company, by a mobile operator, or even as part of a smart city’s municipal project. Each of these scenarios presents revenue challenges that include managing multiple partners, creating new revenue streams and handling revenue sharing and settlements. For example, the bike company’s app requires revenue sharing capabilities with the operator in order to bill the customer via their monthly bill or mobile wallet (a popular alternative in markets where many do not have credit or debit cards). An operator requires a partnership – and therefore settlement capabilities – with the bike scheme provider. And a city app, which can provide many municipal services of which bike sharing is just one, also requires revenue management abilities with the bike company and the operator. Advanced revenue management capabilities are fundamental for handling these kinds of B2B and B2B2C business models. In the world of smart transportation and mobility, operators need a platform that not only is flexible and easy to manage for today’s needs, but which will also easily serve future needs and deliver innovative marketing promotions to its customers. It needs to be able to operate in real-time, so that customers can be incentivized on the ground, and it needs comprehensive functionality to support the associated end-to-end revenue management requirements. For example, a bike-sharing mobile app enables the provider to push a customer towards another bike station where there are bikes available based on his current location, regular use or whatever other parameters the provider sets. If the customer has to make a short walk to get a bike, the provider can incentivize or reward him with a discount. It also makes for a much-improved customer experience by ensuring, for example, that a bike will be at the location he is sent to, reserved for his use only. In the case of a dockless bike-sharing service, customers can be incentivized to leave the bike in a designated station rather than just leaving them in the streets, which would help to resolve the current issue of the clutter and disruption caused by unused bikes being dumped on the streets of cities such as Beijing and London. Alternatively, as in the case of Singtel Group and Mobike’s new strategic partnership across Asia, the partnership with the operator will enable customers to find bikes where there is no GPS tracking, such as roofed bike stations. What we’ve seen is that new solutions are needed to support these evolving new business models. A flexible settlements and billing platform not only enables revenues to be shared quickly and easily but also introduces more business sense into the relationship with the partners and the end customers at a single point, providing an overall better customer experience. As well as a better service, users can also be rewarded by discounts, loyalty points and rewards, and engaged via direct marketing. IoT revenue generation and partner management are key to the success of many new solutions in the world of smart transportation and mobility. By implementing a highly effective and flexible revenue sharing and partner management billing platform, innovative business models and use cases such as these and many others can be supported: what can be offered is limited only by the creativity of what the marketing department can dream up.